The Sinhale National Front lodged a complaint against Northern Province Chief Minister C. V. Wigneswaran, yesterday, at the Police Head Quarters alleging that his statements are evoking racial tension among communities. The organisation highlighted that his recent remarks regarding the removal of army camps from the Northern Province could be a push towards a separatist agenda. Sinhale President Agulugalle SiriJinananda Thero claimed Wigneswaran is behaving in a manner which may give rise to terrorism and separatism in the country again. 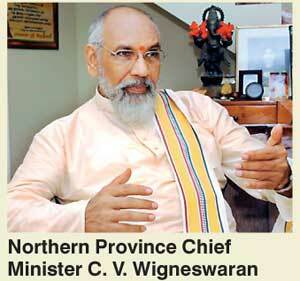 “Wigneswaran has demanded that army camps in Northern Province should be removed and that temples should not be built in the North. He has spoken against settling ‘outsiders’ in the North. Already different politicians and religious leaders have spoken against the Chief Ministers comments. However we think just speaking up against such statements is not sufficient. We need to take action against him, which is why we lodged the complaint against the Chief Minister,” SiriJinananda Thero claimed. However, Wigneswaran, speaking at the closing ceremony of National Sports Festival on Sunday, claimed that his statements have been misunderstood by southern communities. Wigneswaran added he had said that the construction in the Northern Province should be done after receiving proper permission from the Provincial Council and not in arbitrary manner with the help of the Army. Speaking in Sinhala to drive a point across, Northern Province Chief Minister C. V. Wigneswaran claimed that speeches made by him in Tamil have been misunderstood by the Southern community. The Chief Minister who made a last-minute appearance at the closing ceremony of the 42nd National Games held at the Duraiappah Stadium in Jaffna, on 2 Sunday, first addressed the audience in Tamil before switching to Sinhala to clarify a statement he had made earlier last week. He claimed that his objections were against haphazard construction of temples and Buddhist statues in Jaffna without proper authorisation as per existing regulations. “First get a proper translation of my speech and understand what I am saying, then criticise me,” he requested. Before switching to Sinhala for clarity, the Chief Minister went on to explain that he was not included in the list of speakers for the evening originally, but was added last minute. Wigneswaran was a notable absentee from the opening ceremony last Friday as well. “This was perhaps because they have misunderstood my speeches in the South where I am seen as an undesirable person or a bogeyman,” he claimed. The Chief Minister also claimed that some factions of politicians – who in his opinion should be behind bars – have taken his speeches out of context for narrow political gains.